Goodpasture syndrome is a rare antibody-mediated disease causing acute renal failure associated with pulmonary hemorrhage. Circulating antibodies are directed against glomerular basement membrane (GBM), resulting in acute or rapidly progressive glomerulonephritis that is typically associated with crescent formation. Renal and patient survival correlates closely with the degree of renal impairment at presentation. Renal involvement alone may occur in 20%–40% while <10% may have lung involvement alone. Early diagnosis is essential with institution of treatment with plasmapheresis, prednisone, and cyclophosphamide.Some patients with anti-GBM disease may have granulomatosis with polyangiitis (Wegener’s syndrome) or microscopic polyangiitis. We present a case of an 11-year-old child with acute renal failure secondary to anti-GBM disease who presented with severe uremic symptoms and was treated with plasmapheresis, steroids, and cyclophosphamide. An eleven-year-old male child was admitted with complaints of persistent vomiting not responding to antiemetics and gross hematuria. There was no history of bleeding from any other site, skin rash, dysuria, or recent upper respiratory tract infection. There was no significant past illness or family history. On examination, the child looked toxic and pale but was conscious alert and oriented. Blood pressure was 170/90 mm Hg, pulse 88/min, respiratory rate was 22/min, and he was afebrile. Mild bilateral pitting lower limb edema was noted. Abdominal examination revealed mild epigastric tenderness with no organomegaly. Other systems were normal. Initial laboratory results showed Na 134 mmol/L, K 4.5 mmol/L, creatinine 7.9 mg/dL, urea 125 mg/dL, serum albumin 3.2 mg/dL, calcium 8 mg/dL, and phosphorus 4.5 mg/dL. Complete blood count showed white blood cell: 4.39, red blood cell: 3.61, hemoglobin: 9.81 g/dL, hematocrit: 28.5%, and platelets: Urine analysis showed urine protein: Trace, erythrocytes: 60–70/HPF, pus cells: 2–3 /HPF, urinary proteins: 90 mg/L. Chest X-ray was normal and ultrasound showed normal-sized kidneys with Grade 2 echogenicity. Immunological studies showed C3 and C4 to be normal. Antinuclear antibody, Anti Ds-DNA, and antineutrophil cytoplasmic antibody (ANCA) were negative. Anti-GBM antibody level was 590 U/mL (normal up to 7 U/mL). Antistreptolysin O titer 158 IU/mL (0–200). IgA level 212 mg/dL (70–400). Renal biopsy showed cellular crescents in five out of 11 glomeruli, while three showed fibrocellular crescents [Figure 1]. Mesangial hypercellularity and segmental necrotizing lesions were noted. Immunofluorescence revealed moderate linear positivity for IgG, along the capillary walls of the glomerular tuft [Figure 2]a,[Figure 2]b,[Figure 2]c. There was also nonspecific, and weak staining for C1q and IgM [Figure 3]; by IgA [Figure 4] and C3a were negative. Segmental lesions were positive for fibrinogen [Figure 5]. Figure 1: Light microscopy showing fibrocellular crescents. 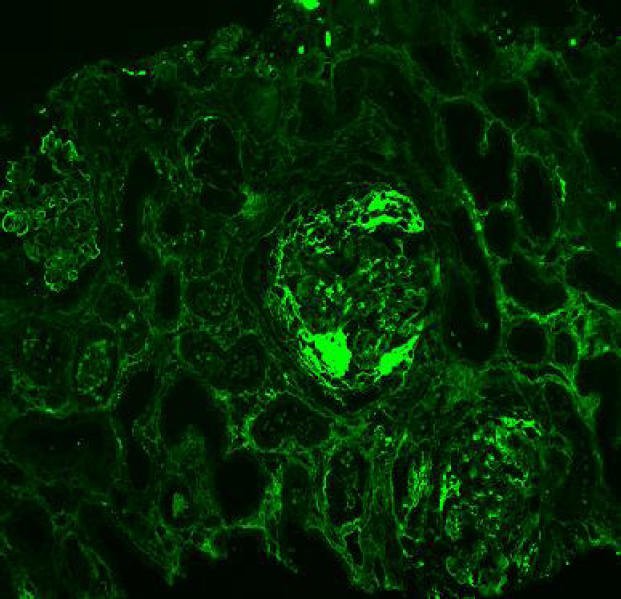 Figure 2: (a-c) Immunofluorescence showing moderate linear positivity for IgG, along the capillary walls of the glomerular tuft. 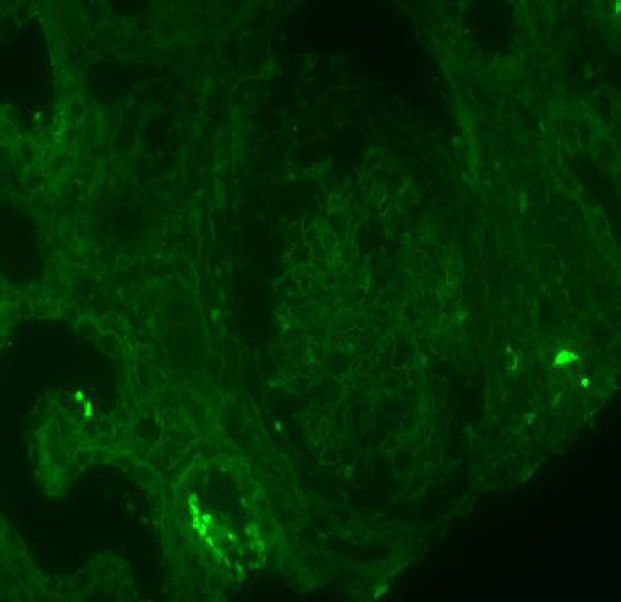 Figure 4: Immunofluorescence showing nonsignificant positive IgA staining. 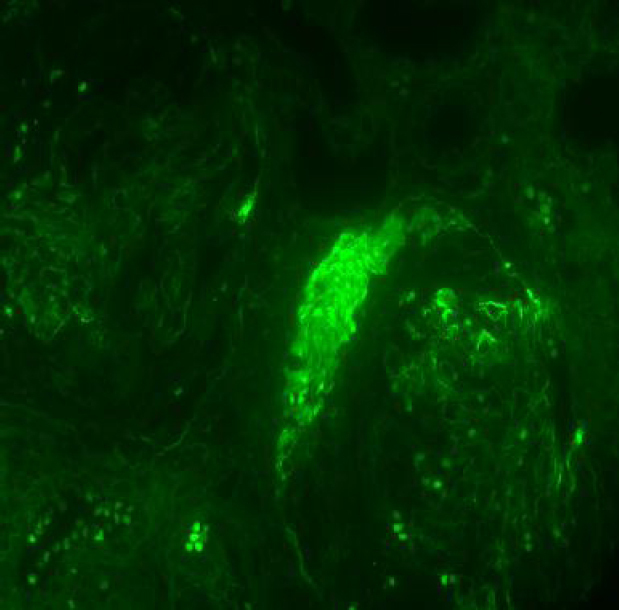 Figure 5: Immunofluorescence showing segmental lesions positive for fibrinogen. The child was started on alternate-day hemodialysis (HD) and received a total of six sessions. He was also simultaneously initiated on alternate day plasmapheresis and received a total of eight daily sessions. High-dose pulse methyl prednisolone (solumedrol) 500 mg intravenous (IV) was given daily for five days followed by a single dose of cyclophosphamide 600 mg IV. His urine output steadily improved from 100 to 1500 mL/day by the 7th day and anti-GBM antibody levels decreased to 42 U/mL (normal up to 7 units/mL) and follow-up of ANCA-p become positive after initial negativity. On day 8 of admission, he suffered tonic-clonic convulsions. Computed tomography brain done showed multiple ischemic lesions suggestive of systemic vasculitis; however, hypertensive encephalopathy could not be ruled out since recorded blood pressure was 200/120 mm Hg. The patient continued to have same management. He received another 14 sessions of plasmapheresis and eight sessions of HD while oral steroids and oral endoxan were continued. Anti-GBM antibody levels, tested after three weeks of the first result, were found to be normal. The child improved and regained near normal kidney functions and was discharged on oral steroids as oral endoxan had to be stopped because of leukopenia. He is doing well on follow-up. Anti-GBM disease is a rare cause of acute renal failure that may be associated with pulmonary hemorrhage, and in this setting, it is named Goodpasture syndrome. Clinical manifestations are similar to acute renal failure. Laboratory findings show impaired kidney function. Urinalysis may show nonnephrotic range proteinuria and a nephritic sediment characterized by dysmorphic red cells, white cells and red cell and granular casts. Detection of anti-GBM antibodies either in the serum or the kidney is diagnostic. Renal biopsy may form a useful guide to therapy. Essential information on the severity of renal involvement forms a guide to therapy and the percentage and type of crescents may help to prognosticate. Immunofluorescence microscopy demonstrates the virtually pathognomonic finding of linear deposition of Ig G along the glomerular capillaries and occasionally the distal tubules. In rare cases, the antibody may be IgA or Ig M.
Renal and patient survival correlates closely with the degree of renal impairment at presentation. Poor prognostic factor in Anti-GBM antibody disease includes need for dialysis at presentation and serum creatinine more than 8 mg/dL. Patients who survive the 1st year with intact renal function generally do well. Patients with moderate to severe disease who do not require dialysis on presentation generally respond to therapy and do well on long-term follow-up. On the other hand, few who require immediate dialysis at presentation may escape the need for maintenance dialysis. In this case, the patient presented with severe uremic manifestations and high serum creatinine (7.9 mg/dL) and required few sessions of HD, so he was expected to have bad prognosis. Some patients with acute glomerulonephritis with or without pulmonary hemorrhage may have granulomatosis with polyangiitis (Wegener’ s) or microscopic polyangiitis. Hence, in anti-GBM disease, patients should be tested for ANCA. Anti-GBM disease and systemic vasculitis have similar clinical manifestations, and it is estimated that between 10% and 38% of patients with anti-GBM antibody disease also test positively for ANCA (almost always anti-myeloperoxidase-ANCA) at the time of diagnosis. Those patients may have signs of a systemic vasculitis and a marked systemic inflammatory response. Even if the patient was negative for ANCA on initial testing, ANCA serology should be repeated specially if there are signs of recurrent disease. The detection of ANCA is clinically relevant, as these patients may be more likely to have treatable disease than those who have only anti-GBM antibodies. However, a larger series suggest that the initial outcome is similar to those with anti-GBM disease alone. Although it is recommended to use oral cyclophosphamide, IV therapy may be used in cases with severe renal failure and oliguria, a setting, in which bladder toxicity of oral cyclophosphamide may be increased and that is why we used IV cyclophosphamide early in this case. The recommended treatment in anti-GBM antibody disease is plasmapheresis combined with prednisone and cyclophosphamide. Plasmapheresis removes circulating anti-GBM antibodies and other mediators of inflammation (such as complement), while the immunosuppressive agents minimize new antibody formation. The recommended initial plasmapheresis prescription is either daily or alternate-day exchanges for 2–3 weeks. Improvement is marked by a decline in serum anti-GBM antibody titers. Plasmapheresis may be continued if the patient still has hemoptysis or antibody titers are still elevated. Most patients are given pulse methylprednisolone (15–30 mg/kg to a maximum of dose of 1000 mg IV) daily for three doses followed by daily oral prednisone (1 mg/kg/day to a maximum of 60–80 mg/day), which can be tapered once remission is induced. This may be accompanied by oral cyclophosphamide at a dose 2 mg/kg/day orally. Several reported cases have documented successful treatment of anti-GBM antibody with rituximab in those who fail to respond to cyclophosphamide. Anti-GBM disease is extremely rare but should be considered in the differential diagnosis of rapidly progressive glomerulonephritis even at a young age, even in the absence of pulmonary involvement. However, in children, other causes of pulmonary-renal syndromes should also be considered like systemic lupus erythematosus, ANCA-associated vasculitis, Henoch–Schonlein purpura, and hemolytic uremic syndrome. Anti-GBM disease, if recognized and treated early, can have a favorable outcome. The presence of ANCA-p may be a good prognostic sign. Kalluri R, Meyers K, Mogyorosi A, Madaio MP, Neilson EG. 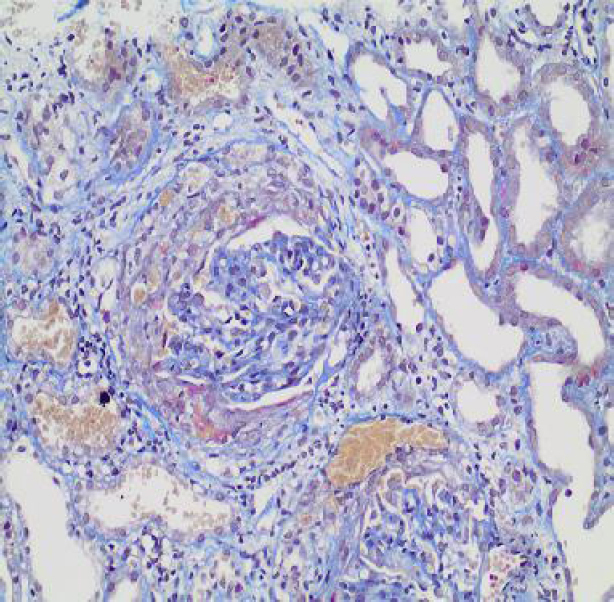 Goodpasture syndrome involving overlap with Wegener’s granulomatosis and anti-glomerular basement membrane disease. J Am Soc Nephrol 1997;8:1795-800. Bolton WK. Goodpasture’s syndrome. Kidney Int 1996;50:1753-66. Borza DB, Chedid MF, Colon S, Lager DJ, Leung N, Fervenza FC. Recurrent Good-pasture’s disease secondary to a monoclonal IgA1-kappa antibody autoreactive with the alpha1/alpha2 chains of type IV collagen. Am J Kidney Dis 2005;45:397-406. Glassock RJ, Cohen AH, Adler SG, Ward HJ. Secondary glomerular diseases. In: Brenner BM, Rector FC, editors. The Kidney. Philadelphia: Saunders; 1991. p. 1280-368. Levy JB, Hammad T, Coulthart A, Dougan T, Pusey CD. Clinical features and outcome of patients with both ANCA and anti-GBM antibodies. Kidney Int 2004;66:1535-40. Rutgers A, Slot M, van Paassen P, van Breda Vriesman P, Heeringa P, Tervaert JW. Coexistence of anti-glomerular basement membrane antibodies and myeloperoxidase-ANCAs in crescentic glomerulonephritis. Am J Kidney Dis 2005;46:253-62. Rees A. Goodpasture’s syndrome. In: Glassock R, ed. Current Therapy in Nephrology and Hypertension. 4th ed. St. Louis: Mosby; 1998. p. 166. Kaplan AA. The use of apheresis in immune renal disorders. Ther Apher Dial 2003;7:165-72. Jindal KK. Management of idiopathic crescentic and diffuse proliferative glomerulonephritis: Evidence-based recommendations. Kidney Int Suppl 1999;70:S33-40. Syeda UA, Singer NG, Magrey M. Anti-glomerular basement membrane antibody disease treated with rituximab: A case-based review. Semin Arthritis Rheum 2013;42:567-72.